Pyrotechnics—from the Greek words pyro (fire) and tekhnikos (made by art)—is the science of materials capable of self-contained and self-sustained exothermic chemical reactions that produce heat, light, gas, smoke, and/or sound. Aside from spectacular fireworks displays, pyrotechnics permeate our daily lives through safety matches, automotive airbags, and military applications, among others. The mechanical applications of pyrotechnics through pyrotechnic mechanical devices (PMD) are prevalent in critical industries such as aerospace and national defense. As the old saying ‘keep your powder dry’ goes, the proper management and maintenance of PMDs are essential not only to maximize their reliability and efficiency but also for the safety of its users. Accordingly, the aging of propellants of the PMDs is considered one of the primary factors of the performance and maintenance, but extensive research into the subject has been sparse. Now, collaborative research conducted by POSTECH and Pukyong National University has uncovered the chemistry behind the aging mechanism of Boron Potassium Nitrate (BKNO3)—one of the most commonly used commercial propellants. PMDs, and by extension, its propellants, must have long-term stability for reliable usage whenever the situation arises. However, the aging phenomena of PMDs mean that they must be disposed periodically to minimize safety concerns in critical applications. The research team recognized the importance of shedding light on the underpinnings of the aging mechanism to increase the disposal period that would in turn lead to economic efficiency and greater safety in industries like aerospace and national defense. 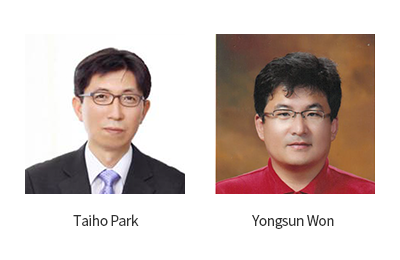 Professor Taiho Park from the Department of Chemical Engineering at POSTECH and Professor Yong Sun Won from Pukyong National University used X-ray photoelectron spectroscopy and transmission electron microscopy to verify the formation of oxide shells on the surface of the boron particles from exposure to humidity, which in turn decreased its efficacy. This achievement was published in the world-renowned Scientific Reports. During their investigation into the aging mechanism of BKNO3, the team was able to rule out extraneous internal factors and discovered that humidity levels affected the heat of reaction and reaction rate. Through TEM-EDS studies, they found that the thickness of the resulting oxide shells gradually increased through prolonged exposure to humidity and were reciprocally related to its efficacy. Professor Park expressed his excitement in applying this new understanding of the aging mechanism of BKNO3 to not only broaden the understanding of PMDs, but also to increase its safety and contribute to the minimization of economic loss by prolonging their disposal period. This work was supported in part by the Agency for Defense Development under the Precise Energy Release for the Pyrotechnic Mechanical Device program.